If you are serious about your Muay Thai training, a belly pad is a great investment. But as you probably know, belly pads are worn by the pad man, as opposed to the person training. So, whether you’re buying the pad for your padman, or you’re buying several for you own gym or class – getting high quality pads at the right price is paramount. In this guide, I will tell you what features to look for in a belly pad, and I’ll also review some of the best Muay Thai belly pads out there – so that you can advance your training to the next level. Here are my top 3 belly pads from some the most trusted Muay Thai brands out there. Fairtex are arguably the biggest name in Muay Thai, so this belly pad is very well made from real leather and solid padding that will absorb really hard shots. 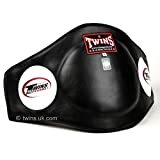 It has a Velcro strap and the pad covers quite a lot of the chest, giving you a big target area to throw knees at – and has targets on the sides for body hooks. Windy are what you might call a B-level Thai brand – they are decent quality, but not as good as Twins and Fairtex gear. However, this pad is well made and solid, but just a little bit lighter than the Twins or Fairtext pads – still a very high quality pad. Twins are one of biggest Thai brands in the sport, and their gear is always high quality. This pad is hand made in Thailand from real leather and extremely tough and durable. It also has a Velcro strap which makes it much easier to take on and off during training. The only negative of this pad is that it doesn’t come up very high on the chest, so you have to be a bit careful when throwing knees. Belly pads take a lot of punishment, as they are often used to train knees and body punches – so they need to be tough and durable. You don’t want the impact of shots getting through to the pad man’s body, and you don’t want the pad falling apart after a few months of use. Ideally you want to choose a belly bad that is made of real leather, and one that is filled with a thick layer of durable foam. Craftmanship is also important so it’s best to go with a pad that is made in Thailand (all of the Thai brands like Fairtex and Twins hand-make their pads in Thailand). Belly pads will either be fastened by Velcro or buckle. Personally I would choose Velcro every time, because buckling and unbuckling a belly pad every time you switch pad man takes ages. Velcro quickly rips on and off, yet stays firmly in place. Belly pads should obviously have a good amount of padding at the front of the belly, but they also need padding at the sides. Without side padding around the ribs, you can’t really train body punches and side knees etc. which takes a lot out of your training. A good belly pad should have circular targets on the side, to give trainers an aiming point to strike. When it comes to buying a belly pad, I would opt for a big well known Thai brand every time (Fairtex, Twins etc.) because you’re guaranteed to get the highest quality. Whilst some of the big western MMA brands like RDX have started producing some really good fight gear, like gloves and shin guards – they still haven’t got it quite right with the big gear like belly pads and heavy bags. Once you’ve got yourself a decent belly pad, you need to known the best ways of training with a pad man, to get the most from it. This video below gives a good overview of how to train with a belly pad – have a quick watch, and then I will look deeper into specific areas. Belly pads allow you to train knees in a much more realistic fashion than with long pads, as you can deliver the knees straight to the body. You can practice long range walk-in knees, and the pad man can also throw shots at you to test your guard when throwing. You can also clinch the pad man and throw knees at the pad from the clinch, using both front and side knees. You’ll need to train with a hardened experienced pad man though, as it can be quite punishing being thrown around and kneed repeatedly for a beginner. Belly pads are great for training body hooks, giving you a realistic target to strike and freeing up the pad mans arms to allow for quicker follow up shots. This video from Everlast shows Teddy Atlas training a fighter to throw body shots to the belly pad. It’s a boxing training session, but the principals are the same. A strong and consistent teep kick is essential in Muay Thai, so the belly pad provides a great way of keeping it sharp. When you’re working on the pads and the pad man throws a few shots to test your guard, you can always throw a teep out to connect with the belly pad, and push them back or off-balance. This video of Muay Thai legend Samart Payakaroon gives away some good teep tips. Belly pads are an excellent training tool for Muay Thai, but you must ensure that you use a high quality one, and train with it correctly. As mentioned, I would suggest a leather pad from one of the main Thai brands if you want adequate protection and a pad that will stand the test of time.